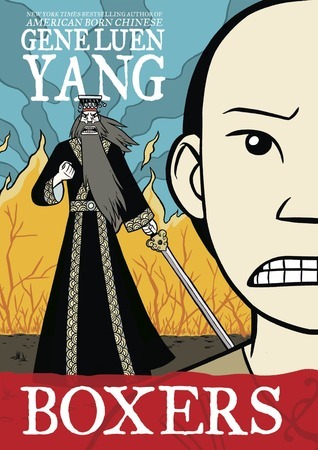 I was completely blown away by Gene Luen Yang’s Boxers and Saints, a two volume graphic novel series that depicts the 1898 Boxer Rebellion in China from the perspective of both sides. In Boxers, Little Bao has had enough of the way foreign missionaries and soldiers have been robbing and bullying Chinese peasants. Channeling the power of ancient Chinese gods, he raises an army of Boxers, kung fu-trained peasants, and they wage a rebellion against the foreigners. Despite their lack of resources, the power of the gods is on their side, and they are successful in their fight. I love how Yang keeps the story complex — it would be all too easy to simply cheer on the Boxers in their fight, but Yang shows how their anger drives the Boxers towards violence, sometimes beyond reason. The fight as well isn’t just against foreigners, but also against “secondary devils” — Chinese citizens who have converted to Christianity. In a particularly powerful moment, Bao and his army “rescue” a train of Chinese peasants from foreign missionaries, violently slaughtering the missionaries and then turning to the peasants in triumph. Rather than expressing gratitude, one of the Chinese peasants picks up a Bible and attempts to continue the prayer. This not only confounds Bao, it enrages him — a Chinese turning Christian is a betrayal, and Bao’s response, coupled with Yang’s sketches of the utterly terrified peasants, is chilling. Boxers begins as a coming of age, kung fu training story, and turns into a potent emotional wallop of political history. Bao is a complicated hero figure and ultimately a tragic figure of a man. War scars you, and Yang does not shy away from depicting this scarring even amongst the fantastical illustrations of Chinese gods. Bao’s struggles feel real, and Yang writes his character so well that you understand Bao’s choices even when you can’t agree with them. Possibly my favourite part of Boxers is the Red Lanterns, an all-female army led by Mei-wen that joins the Boxers in their fight. It’s great seeing women warriors play such an important role in the rebellion, and shattering glass ceilings all the way back in 1898. A woman inspired by Joan of Arc is the heroine of Saints, which explores the other side of the story. An unwanted fourth daughter, Vibiana finds love and belonging with a kind Christian couple, and converts to their religion. We see the Boxer Rebellion from the perspective of Christian Chinese, to whom Bao’s army aren’t heroes but rather terrifying figures. While Bao’s position in the rebellion has always been clear-cut, Vibiana is much more conflicted, and in many ways, a much more intriguing character, torn between loyalty to her heritage and devotion to the community that took her in. Saints is disappointingly much shorter than Boxers — without the kung fu training montages or the need to set up the beginning of the rebellion, Viviana’s tale is kept relatively blood-free until the second half. I wish Yang had delved a bit deeper into the perspective of the Christian Chinese, particularly what so many of them had found appealing about the new religion. 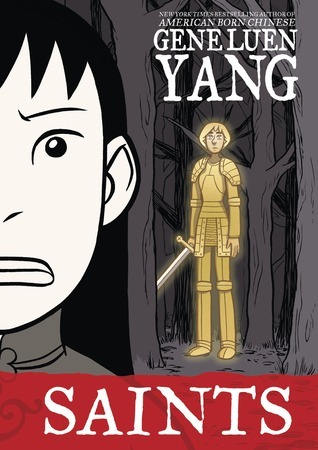 Still Vibiana’s story is compelling enough to give pause to Bao’s victory, and when their stories intersect — a rather brief encounter where neither knows the other’s story — Yang’s restraint in the scene belies the emotional impact of the moment. Boxers and Saints is a powerful story and its impact is heightened by presenting both perspectives. The back of the book has the tag line “Every war has two faces” and the covers side by side illustrate this with discomfiting symmetry. Both these books bring the Boxer Rebellion to life and make this moment in history feel real and more than that, feel personal. Thank you to Raincoast Books for a copy of these books in exchange for an honest review. This entry was posted in Book Reviews and tagged 50BookPledge2014, Fiction, Graphic Novel, Historical, Raincoast Books by Jaclyn. Bookmark the permalink.